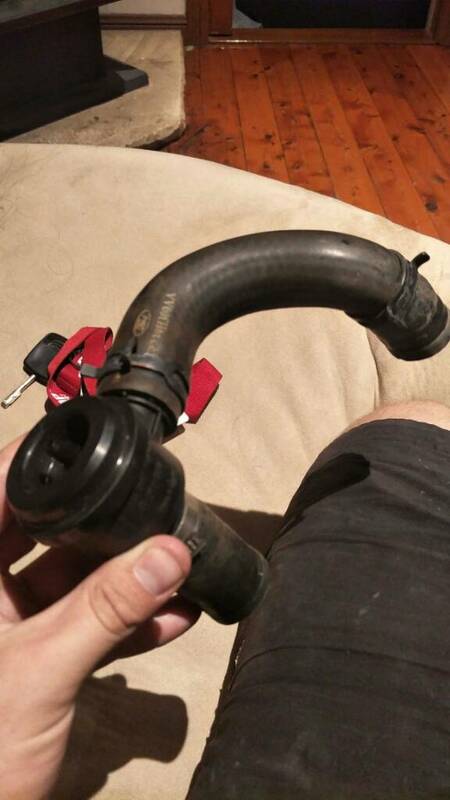 Hey guys ive got a horrible sound its a like skreik sound from my turbo on boost it make its bost target but sounds horribly I have got one loss manifold bolt, the turbo is missing 2 nuts which im.waiting to replace could this be the issue whats a good way to test for a boost leak cheers. yeah, sounds like you have a leak at the exhaust manifold to turbocharger join. you can do it when it's in the car, it's just difficult. sockets and a uni-joint and some access from the underneath for the hard bottom ones, top ones you can get spanners onto. Yeah I have unis and stuff and I can get the top 2 but do I need to do.from bottom.of car? They are M8x1.25 studs for the turbocharger-exhaust-housing-to-dump-pipe studs. Thank you very much for your help keith I will source some nuts today from the local nuts and bolt shop, hoping this eliminates my annoying sound maybe will help with less of a boost leak. 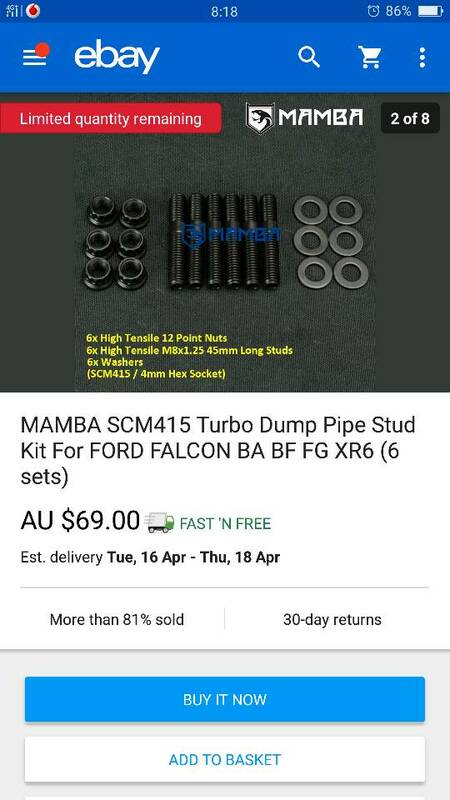 Would you recomend these as the stud kit for the dump pipe to turbo? Also have a question keith I seem to have a high pitched squeal coming on boost at around 4000rpm, sounds boost related ive had to cable tie my bottom intercooler hose because its been a *beep* and dropped below my bar can something like that affect boost noise if its pinched in about 8cm. Cheers brother. that'll just be your regular boost leak, most likely. Probably be a good idea to smoke test it hey? So tonight I brought the factory blow off valve to replace the stupid blocked off sh*t the previous owner had done I was hoping u could shed some light on where to find the vacuum line that goes into the top of the bov. but since you don't like it, the vacuum hose will come off a t-piece at the back of the plenum. Blocked off bov sounds like its guna stall and u lose boost with the turbo..
it's hardly any lost boost if you're up it... it's manual vs auto that loses more boost (manual does) on gear changes... the idea of a BOV is to throw away all unused boost when you get stop accelerating, so I don't know what you want from it. Not sure why you'd think a dose sounds like "guna stall" but it sounds like your car has a different problem if it does actually make the car come close to stalling. but if you don't like the sound itself, that's fine. and have a hobbs switch to get rid of spark during hte change to allow for flat shifting and the associated gearset to be able to flat shift without doing much damage? yep.